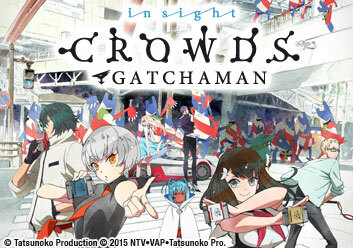 Time to catch up with the Gatchaman as they rescue a hapless prime minister from strange red colored CROWDS! Tsubasa's life changes forever when a giant spaceship lands near her home, revealing a cute alien girl that the Gatchaman have come to investigate! Tsubasa has joined the ranks of the Gatchaman! Meanwhile, Rui continues in his efforts to find out more about VAPE. Gelsadra and Tsubasa are invited to OD's Millione Show as guests and meet the rest of the Gatchaman crew. Later, the leader of VAPE makes his move. Tsubasa intervenes in a standoff to save a critically injured Rui. Then, Gelsadra learns a bit about Earth politics as an impromptu race for Prime Minister begins. The election for Prime Minister is causing political rifts between friend and foe alike. Even the Gatchaman are divided as Gelsadra makes an unexpected promise. Gelsadra and Tsubasa continue their pursuit of unity in the name of world peace as the rest of the Gatchaman begin to question their methods. Hajime and the rest of the Gatchaman grow increasingly uneasy with the direction Tsubasa and Gelsadra are taking their campaign as a strange new threat appears! The Kuu-sama are becoming integrated into society as the Gatchaman finally seem to be on the same page. While public opinion causes the Kuu-sama to become increasingly volatile, Tsubasa finally reunites with the Gatchaman.